Before 1784: son of Bandô Zenji I, his first stage name is Bandô Momotarô I. 11th lunar month of 1784: Momotarô performs as a koyaku at the Moritaza in the kaomise drama "Sakura-ga-Mine Tennyo no Yomeiri". 11th lunar month of 1801: Bandô Momotarô I takes the name of Bandô Zenji II at the Ichimuraza, performing in the kaomise drama "Otoko Narikeri Onna Masakado", which celebrates the shûmei of Omegawa Kyôjûrô, Matsumoto Kôshirô V and Ichikawa Komazô IV; his father Bandô Zenji I takes the name of Bandô Hikozaemon I at the Nakamuraza. 7th lunar month of 1804: premiere at the Kawarasakiza of Katsu Hyôzô I's drama "Tenjiku Tokubê Ikoku Banashi"; Zenji plays the roles of Hôjô Tokigorô Ujitsura and Gotahachi [casting]. 11th lunar month of 1807: he becomes katakiyaku and plays at the Ichimuraza the role of Tsukiji Nyûdô in the kaomise drama "Kigoto no Hana Yashima Kaijin". 3rd lunar month of 1814: premiere at the Ichimuraza of Tsuruya Nanboku IV's drama "Sumidagawa Hana no Goshozome", commonly called "Onna Seigen"; Zenji plays the roles of the okujochû Tsukijino [more details]. 7th lunar month of 1815: premiere at the Kawarasakiza of Tsuruya Nanboku IV's drama "Haji Momiji Ase no Kaomise" (commonly called "Date no Jûyaku", in English the ten roles of Date), whose plot and characters belong to the "Meiboku Sendai Hagi" world; Zenji plays the role of Ôba Dôeki [casting]. 11th lunar month of 1825: Bandô Zenji II takes the name of Bandô Hikozaemon II at the Nakamuraza, playing the roles of Shigaraki Setohei and Tsukishima Katôji in the drama "Oniwaka Kongen Butai". 6th lunar month of 1827: premiere at the Kawarasakiza of Tsuruya Nanboku IV's drama "Hitori Tabi Gojûsan Tsugi"; Hikozaemon plays the role of the anma Keimasa, later the traveller Yajirobei [casting]. 11th lunar month of 1835: Bandô Hikozaemon II takes the name of Bandô Zenkô at the Moritaza, performing in the drama "Hanayagura Kabuki no Jintori" which celebrates the shûmei of Ichikawa Kuzô II. 4th lunar month of 1836: Bandô Zenkô takes the name of Tsukiji Zenkô in the same theater. 1st lunar month of 1838: he takes back the name of Bandô Hikozaemon II at the Ichimuraza, playing the roles of Kannami Tanzaemon and the zegen Bunkichi in the new year drama "Date Kurabe Zensei Soga", whose plot and characters belong to the "Meiboku Sendai Hagi" world. 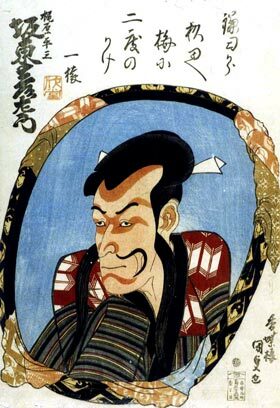 1st lunar month of 1840: Bandô Hikozaemon II takes the name of Bandô Ichien at the Kawarasakiza, playing the role of Kajiwara Heizô Kagetoki in the new year drama "Ume Sakuya Wakagiba Soga". 1st lunar month of 1841: he takes back the name of Bandô Hikozaemon II at the Kawarasakiza, playing the roles of Hakone no Hataemon and the tedai Tokuemon in the new year drama "Koi Zumô Yawaragi Soga". 1842: Hikozaemon retires from the stages and spends his latter years in Yotsuya. Bandô Hikozaemon II was a popular and talented Edo handôgataki and dôkegata actor. He was nicknamed "Tsukiji no Sensei" (Tsukiji's teacher) and his last ranking, in the 1842 Edo hyôbanki, handôgataki section, was jô-jô-(shiro)kichi (superior - superior - (white) excellent).